Young fans attending the TicketGuardian 500 race weekend at ISM Raceway will be able to meet Monster Energy NASCAR Cup Series drivers Ryan Blaney, Clint Bowyer and Corey LaJoie at a youth autograph session on Friday, March 9. The session is open to 100 racing fans 12 years old and under, on a first-come, first-served basis. It begins at 12:15 p.m. on the DC Solar Power Pavilion. Blaney and LaJoie are some of the up-and-comers in the Monster Energy NASCAR Cup Series; both entered the series within the last two years. Bowyer is a veteran of the sport, although he switched teams in 2017 to Stewart-Haas Racing, replacing legend Tony Stewart. 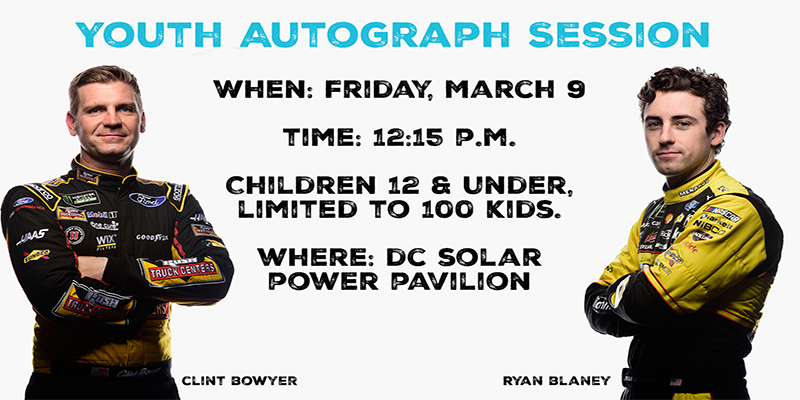 There will also be an all-ages autograph session on Friday at 10:15 a.m., also on the DC Solar Power Pavilion, featuring most of the NASCAR Xfinity Series field. Both autographs sessions are free of charge, however, a Friday Grandstand Ticket is required to get through the admission gates. Tickets for Friday, which features Monster Energy NASCAR Cup Series Qualifying start at $5 for youth and $20 for adults. Tickets can be purchased at ISMRaceway.com.